Angelina provides belly dancing solo or group performance for special events and weekly instruction. She has been performing the art of Middle Eastern Belly Dance in Chicago and various venues throughout the United States, running the gamut from stage shows to corporate & cultural events, bachelorette parties, nightclubs to weddings. 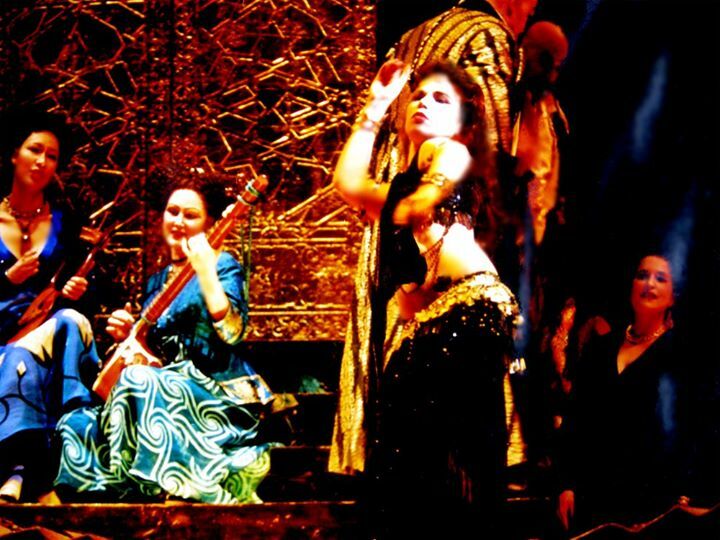 Angelina's most prestigious performance was as Principle Dancer in Chicago's Lyric Opera production of Thais, starring Renee Fleming (can be seen in photo gallery). Angelina danced at a party we held at our home, and she was fantastic. She has a lovely personality, and was comfortable engaging with all the guests, moving around the room and dancing for and with them. When our guests gathered around her to watch her dance, she put on quite a show. She has a great energy about her, and was a treat for all to enjoy. I would recommend her in a heartbeat! Angelina performed for my sisters wedding and had everyone up and dancing. We all had such an amazing time. She was everything we hoped for. Super fun energy, thrilling dance performance, gorgeous costumes, totally professional and great connection with audience — getting everybody up on their feet and dancing. A memorable event for all! We had her for our wedding this past weekend & it was great. She coordinated with my Dj to make a surprise entrance which I had no idea about, extremely appropriate for all guests, she got people up to dance, danced to both Greek & Arabic music. An amazing highlight to the night! Angelina is a dancer I would book again! Angelina recently preformed at my parents going away/retirement party. I was completely satisfied with her performance and especially with working with her as a person. She is a beautiful and talented dancer, and is great at including the crowd to participate. We all had a lot of fun, and you can tell that Angelina has a passion for what she does. I recommend her for a variety of events, and if I need another belly dancer, I will hire her again! Angelina did a magnificent job at performing and entertaining the guests, she was energetic and everyone had a very good time joining in as well. Definitely recommend Angelina! Angelina was trained under renowned master performer, instructor, choreographer and the co-author of The Art of Belly Dancing, Dahlena whom she has been graced by having as mother. She has been teaching Belly Dancing for 12 years. She has taught Cabaret, Folkloric and Spanish Fusion, particularly in the Dahlena Method, since 2001. Angelina has also taught Children's Belly Dancing - to age 7-14 for six summers, at the Belle Plaine Dance Studio in Chicago. At The Belle Plaine Summer Art Camp Angelina taught the girls choreography, how to choreograph, count music, use props, write choreography, solo dance and how to teach each other. Angelina is available to perform for private parties, group classes, events and workshops. She is now teaching weekly group and private classes in Chicago. A mini-class and performance can be offered at your special event!